If you'd like to stay for the season, bring a group, hold a family reunion, a wedding reception or any other activity here at Woodmore Campground, we'd like to help. We have the following amenities available. Sometimes the ideal solution to a busy life is the convenience of being all set up for the season. As a seasonal camper, your camping begins mid May and ends Columbus weekend in October making Woodmore your home away from home. No need for hauling every weekend, or spending lots of time with set up and break down. You simply drive in, and relax. If you would like additional information about seasonal camping please complete the reservation form so that we have the information necessary to to meet your needs. Not sure if you are ready to commit to a full season, consider a monthly reservation to try it out. 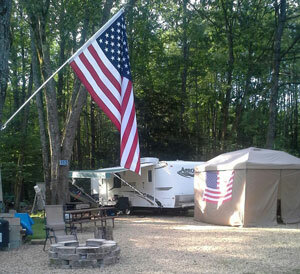 We welcome you to come tour our campground during the active camping season mid May - Columbus day. Our ball field and arcade are available for birthday party rental week days or evenings during our open season. Advance reservations are required please email us about your party for details and availability. Our Safari Field Area is centrally located within the campground and a perfect location for group outings, or family or reunions. The field is located near the activity and pool areas and between our two-bathhouses for your convenience. This grass area with apple trees and large pines for shade can accommodate groups of many sizes. There are water and electric hookups on the field for up to 20 camping units depending on unit sizes. Electric hookups for two 50-amp units and eighteen 30-amp units are available. It is equipped with picnic tables, individual fire rings and a large central fire pit for group bon-fires. Bon-fires are subject to approval based on weather conditions. A minimum of 10 reservations is required for a group to occupy the safari field without other campers. We recommend making reservations early for our Safari Field or other Rental Areas. We ask those considering booking dates for a group that we are a family campground and groups like other campers are expected to respect our rules and quiet hours. Please contact us with any questions or if we can assist you in planning your trip.